Happy Halloween! Today wraps up the 8 Spooky Nights Nail Art Challenge, so no more Halloween nail art after today - boo! Since it's the last, I tried to make something sort of unique. Unique indeed! For me, at least. I don't typically do 3D nail art or apply much for rhinestones or other small objects, but I like it, so I may have to do more in the future! I'll also have to figure out how to get them to stay on without globbing on topcoat. The stars and stripes together are a little flashy and gaudy, but I guess that's what's fun about holidays - you can get away with some crazy things that you typically wouldn't! I think they'll be fun for the day and will be festive as I hand out candy to little kids tonight. 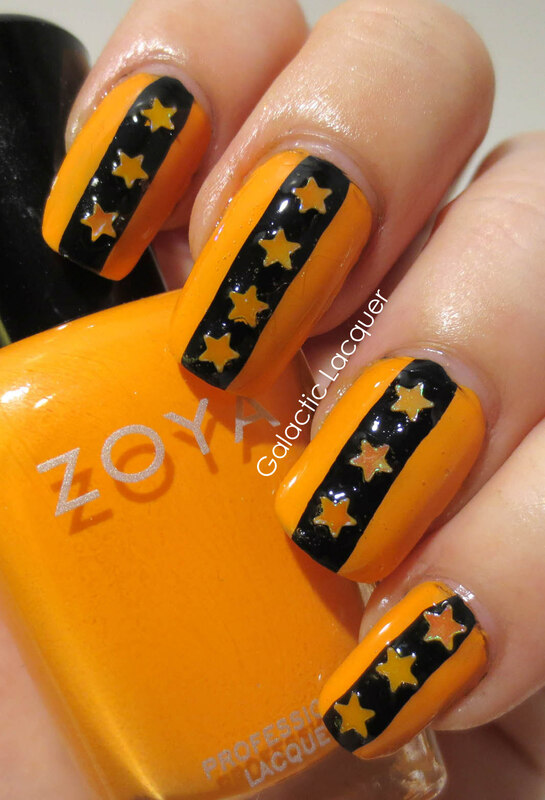 I used Zoya Sharon for the orange, and first applied two coats of it. I then free-handed a black stripe down each nail with Wet n Wild Black Creme. The brush inside of this bottle was a great size for it, and allowed me to avoid taping. I then took some tweezers and placed the little orange stars in the wet polish, one by one. It was a bit tedious! I then topped it off with a couple coats of Seche Vite so the stars would be sealed inside. Well, they're a bit crazy, but I like them! They almost remind me of a carnival with the stripes and stars. I'll have to try out some more 3D nail art that's still wearable in the future. 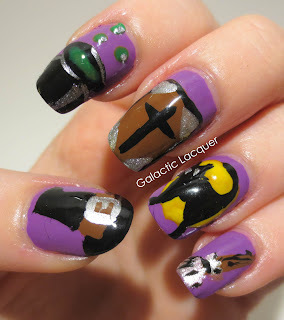 Don't forget to see how these other ladies wrapped up their Halloween nail art too! That was a nice break we had! 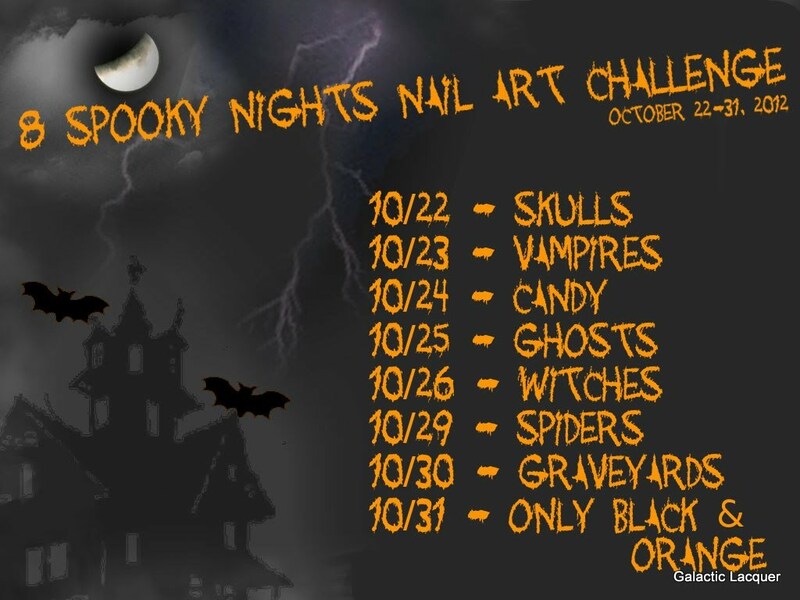 The 8 Spooky Nights challenge was on hold for the weekend, but continues today! I'm super excited about this week's challenges since they all sound really fun to do. Today's challenge is spiders. I'm not a huge fan of spiders, but I'm not arachnophobic either. Still, I think they're fun for Halloween, and they certainly made for some fun designs to do on nails. 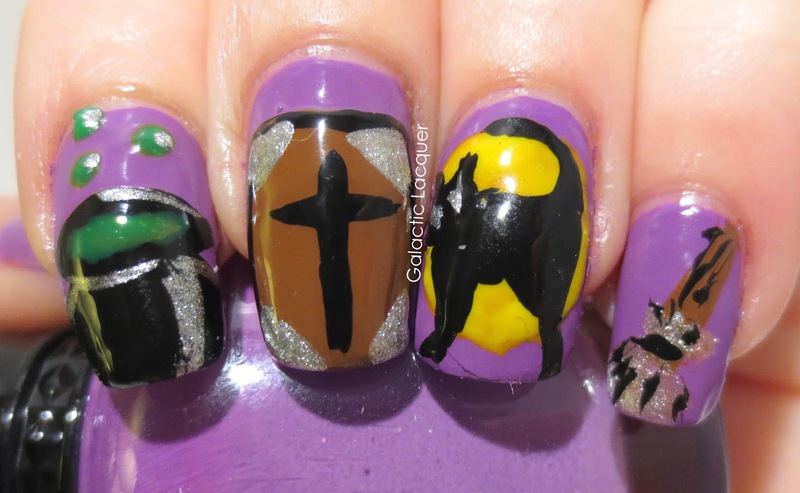 I actually had trouble just choosing what to put on five nails since I had too many good ideas! 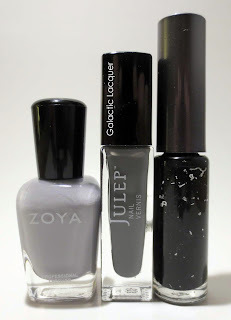 I started off by painting all of my nails gray. I tried to choose a medium shade of gray so that both black spiders and white webs would show up well. 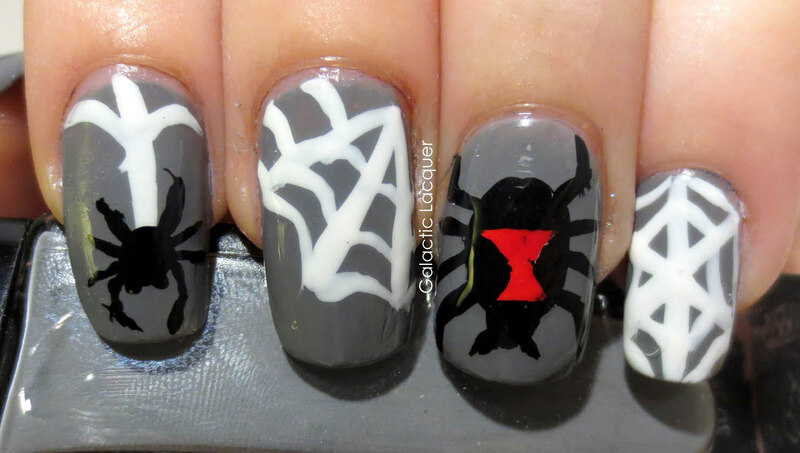 I then added the white spider webs, the black spiders, and added the red hourglass for the accenting black widow. I love how the rest contrasts! 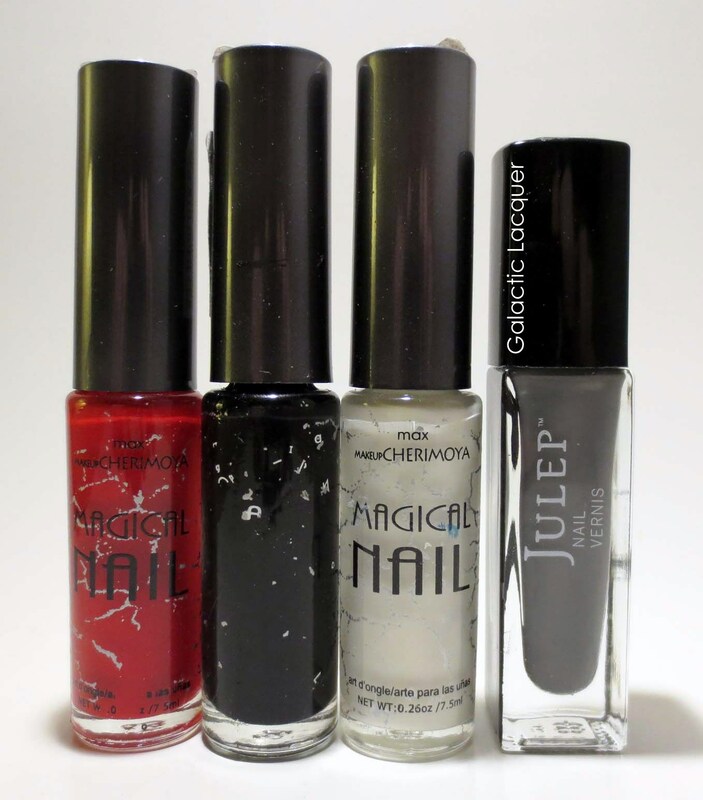 I used Julep Meryl as my base color on all nails. 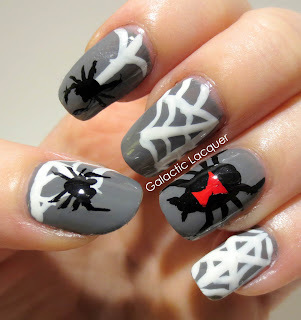 I then free handed the webs using a nail art polish (small, thin brush inside) in white. I also free handed the spiders and their legs with a black nail art polish, and added the hourglass on top. I'm super excited with how these turned out! I'm also very happy since I did them while feeling pretty sick with a fever. I hope I'm feeling well enough for the rest of these now! Half way through the 8 Spooky Nights challenge as of today! Four down, and four to go. 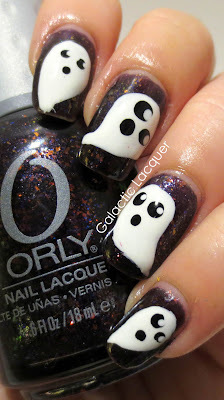 Today's challenge is ghosts, so I created some cute ghosts on top of one of my favorite polishes! I couldn't really decide if I wanted to do spooky ghosts or cute ghosts. I didn't really think of a way to do scary faces for ghosts, so I went with cute ones! 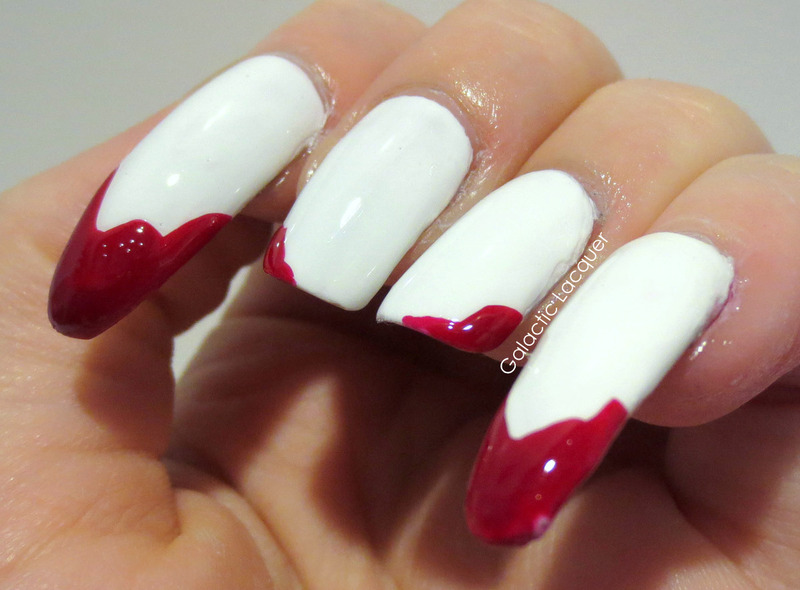 I used Orly Fowl Play, Wet n Wild Black Creme, and Wet n Wild French White Creme. 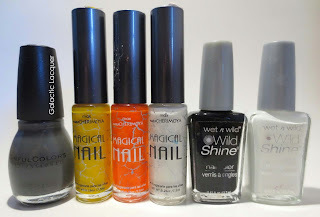 I know I use the two Wet n Wild ones a lot for nail art, but they're perfect! I applied three thin coats of Fowl Play first. 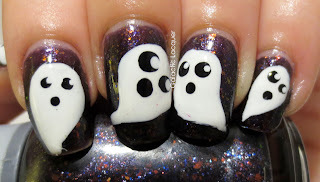 I then free-handed the ghosts on in white with a thin nail art brush. I dotted the eyes and mouths on in black with a large dotting tool, and then used a smaller one to dot the white on the eyes. I'm really happy with how these turned out! 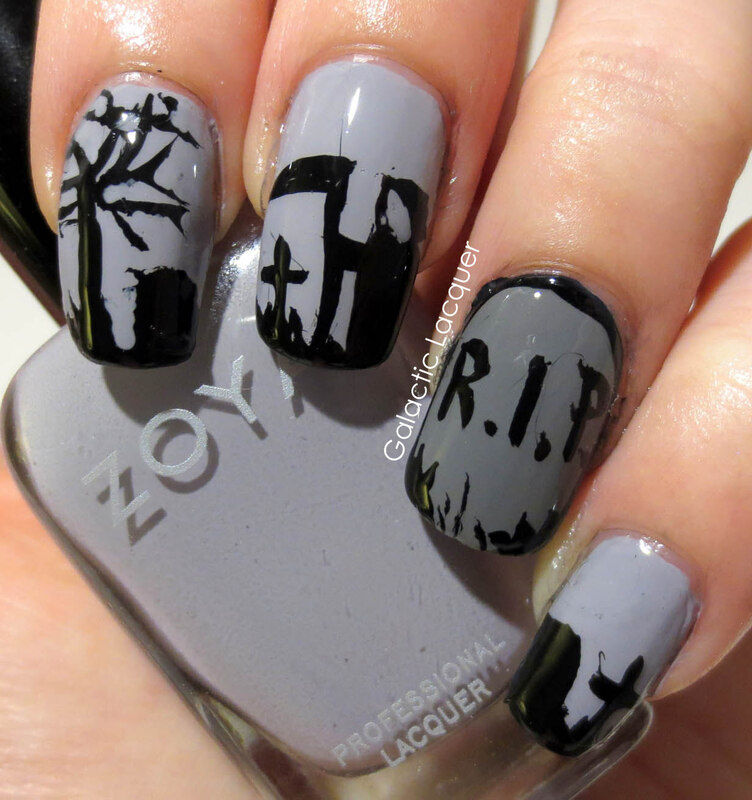 I think they're really cute for how simple and easy they were to create! 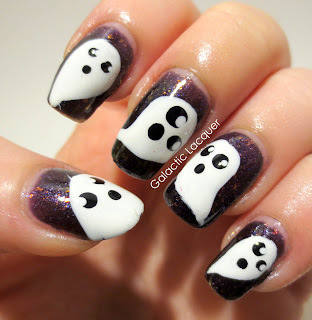 Don't forget to check out what these other bloggers did for their ghost nails! Hmm, candy. What could I possibly do for a candy design, around Halloween time? That's right, candy corn! 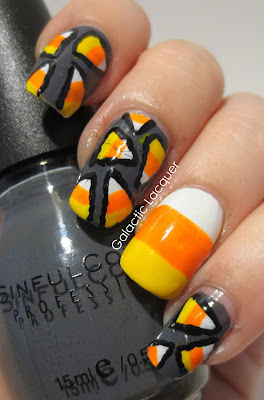 I know candy corn makes for an incredibly popular design, but I love it. 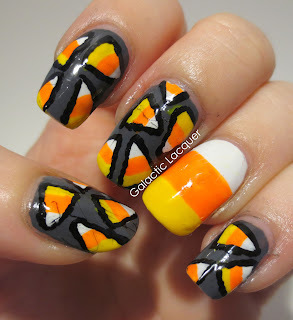 I love candy corn - it's so bright and colorful, and it tastes great. So why not? 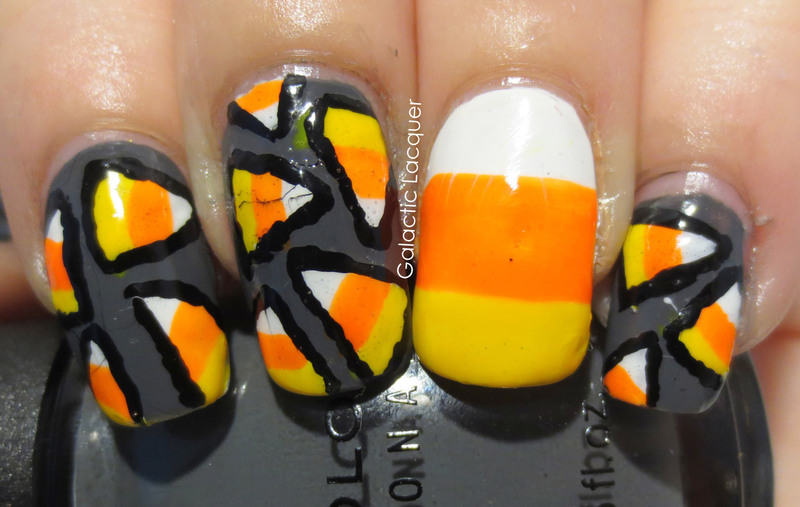 Instead of doing just candy corn colored stripes on each nail, I decided to make a smaller candy corn pattern. I did do the typical striped version on my ring finger nail, and I like how it serves as an accent nail! I started off using Sinful Colors Smokin, which I actually just picked up on Monday for 99 cents at Walgreens (they're on sale this week!). I applied Smokin to every nail except my ring finger nail, which started off with Wet n Wild French White Creme. 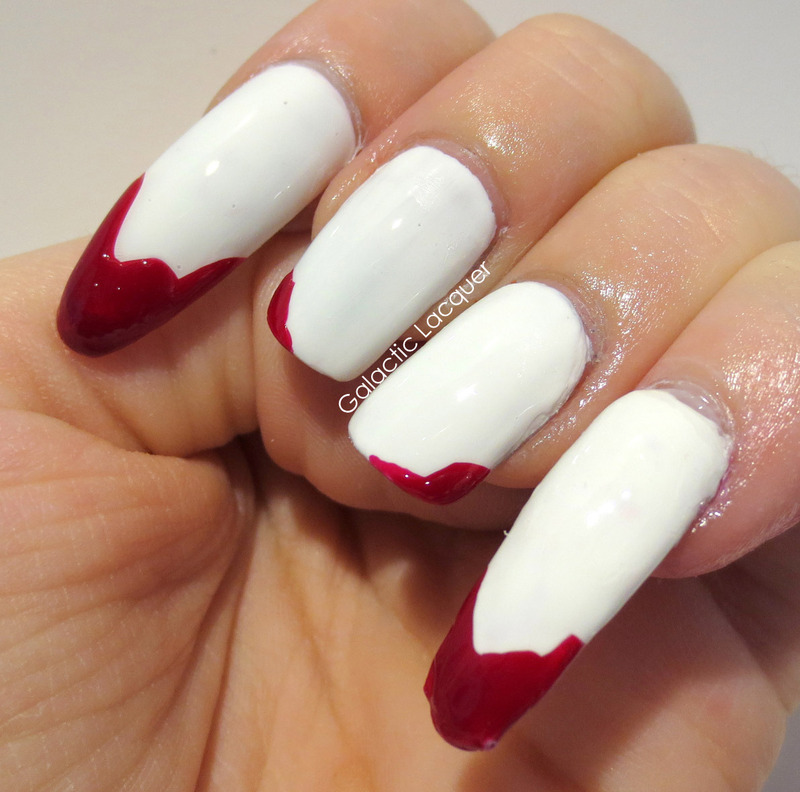 I then took my white nail art polish (with the thin brush inside) and started making white triangles randomly on each nail. After the white dried, I applied the yellow at the bottom of each triangle, and then the orange. The white served as a nice base coat for each candy corn piece, so the colors appeared brighter than they would have right on top of the dark gray. 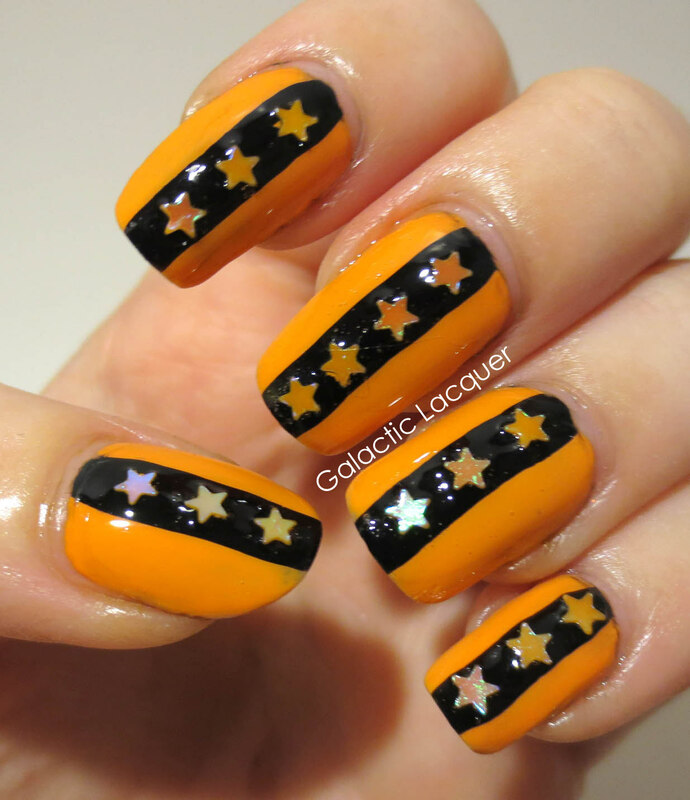 I used the same nail art polishes to stripe the accent nail, and then outlined each small candy corn piece with Wet n Wild Black Creme and a toothpick. Once again, another Halloween manicure I'm happy with! Halloween is my favorite holiday, so I suppose it isn't difficult to make me happy with this kind of stuff either! I'm only a little disappointed that the black started to dry and get stringy by the time I was finishing up (the thumb was last), and then my Out the Door topcoat made it streak a bit more! Oh well, I still like it. Check out how these other bloggers did their candy nails! 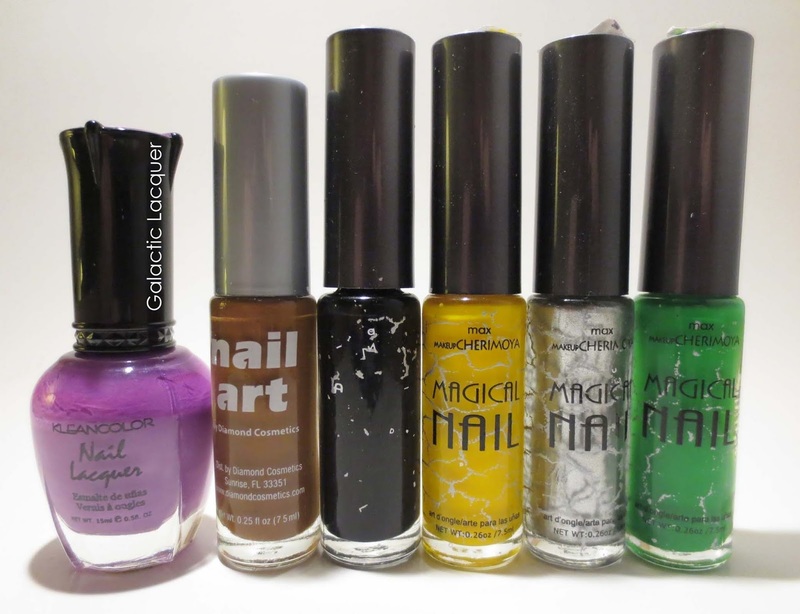 Today kicks off another exciting nail art challenge! 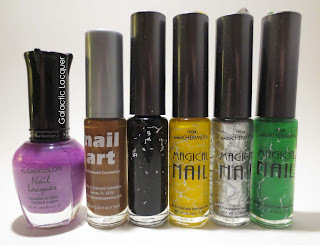 Once again, I am doing this challenge in conjunction with some other lovely blogging ladies, so don't forget to check out their nail art as well! 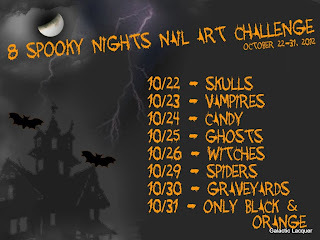 The others participating will be linked at the bottom of every 8 Spooky Nights post I write. Since today's theme is skulls, I decided to do sugar skulls. This is my first attempt at sugar skull nail art, and I love the way they turned out! They're a little messy in spots (excuse the cuticles today), but I had fun doing them. They're also just so colorful and fun to look at! 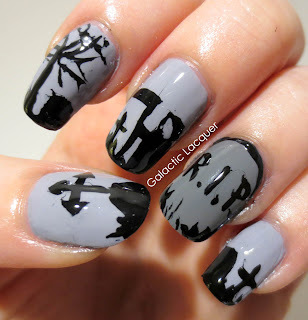 I used quite a few polishes to create these skulls. I used Wet n Wild Black Creme, Wet n Wild French White Creme, MM Cherimoya Charcoal, KleanColor Neon Orange, KleanColor Neon Green, and KleanColor Lavenbaby. I also used flower fimo stick slices for the eyes. 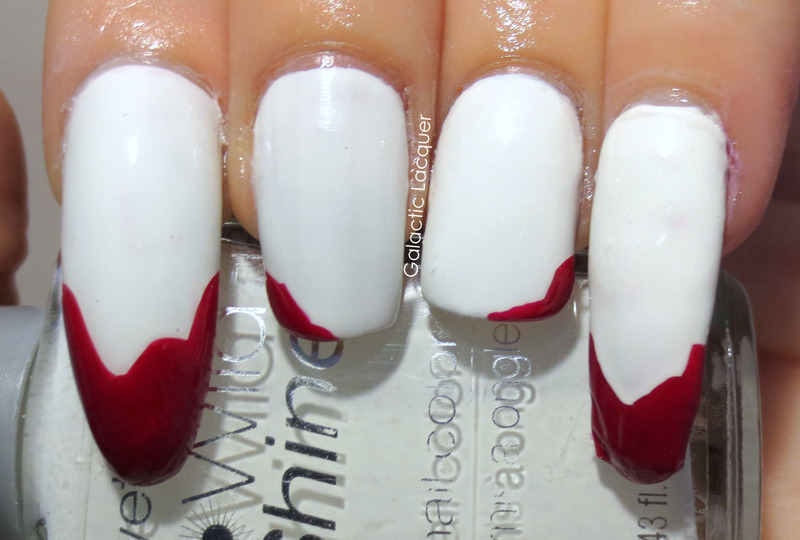 I started off by painting each nail with two coats of white polish. Then I placed the flower fimo slices where I wanted the eyes while the second coat was still wet. I freehanded the nose and cheek parts with a black nail art polish (thin brush inside), and then made the teeth with the tip of a toothpick. 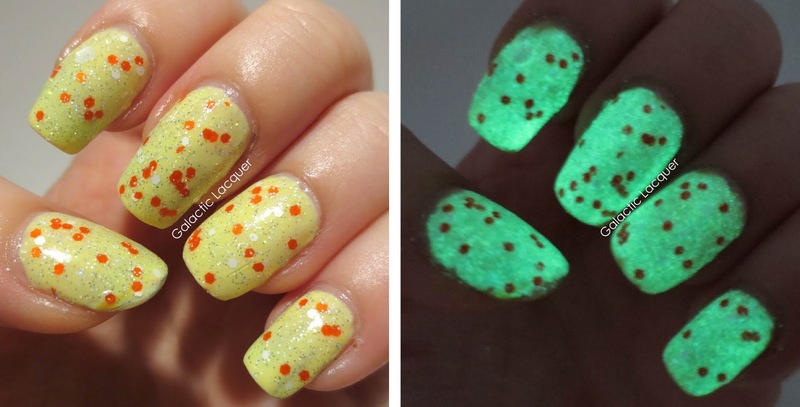 I dotted a few extra colorful dots in bright colors, and topped it all off with a thick coat of Seche Vite! This helped seal the fimo slices so they would stop peeling up on the sides (my nails are very curved), although I think I put a bit too much on since I got bubbles! Well, at least I learned. I'm still very proud of them for my first attempt at it, so hopefully they'll just be better next time! Now I'm already looking forward to the next challenge! I'll have to start planning ahead with what I want to do for each day's challenge. Also if you are a non-blogger and would like to participate in this challenge (for a prize! 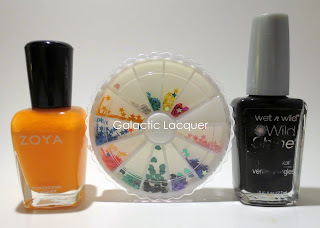 ), then here is the information from Peace Love Lacquer who is hosting the event. The prize is a secret, but I think it might be an awesome Halloween indie polish! All qualifying participants' Day 8 photo will be placed in a folder on November 1st and voting will be most likes. Voting will close at 6pm Pacific on Monday November 5th. The official winner will be announced the morning of November 6th. If you have any questions, feel free to ask or email Peace Love Lacquer! 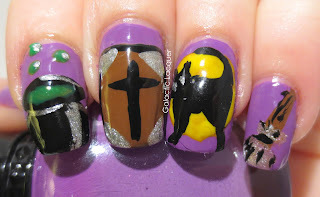 More Halloween polish! 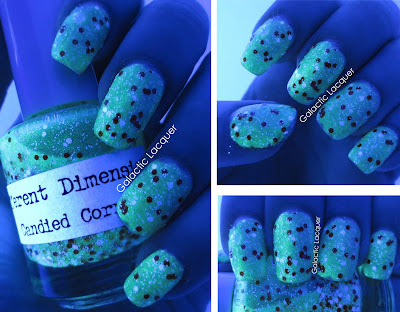 I had almost forgotten about this one since I ordered a while ago along with some of Daring Digits's Minecraft polishes. I decided now was the perfect time to use it, so I didn't want to miss my opportunity! 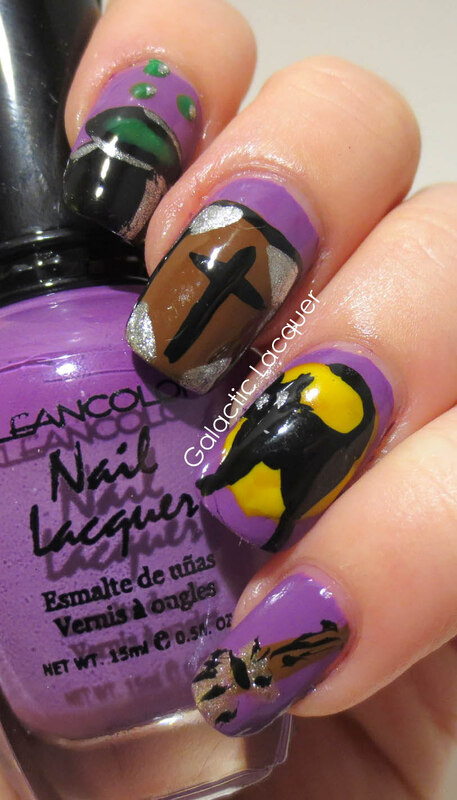 Trick or Treat is a great fall polish. 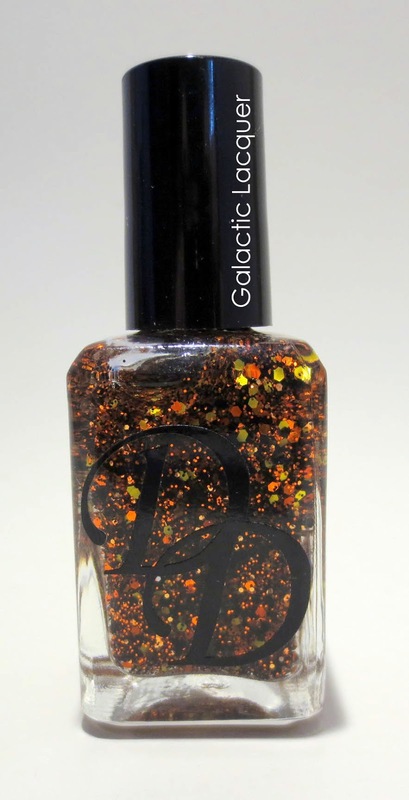 It's a clear base filled with glitter, mostly black and orange. 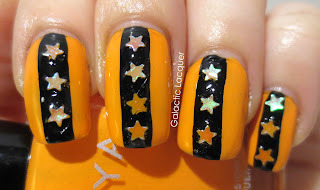 The hexes are all medium sized, but there is also black and metallic orange microglitter to fill in the gaps. The larger hexes are also black and metallic orange, but there are a couple different shades of orange, as well as yellow too! 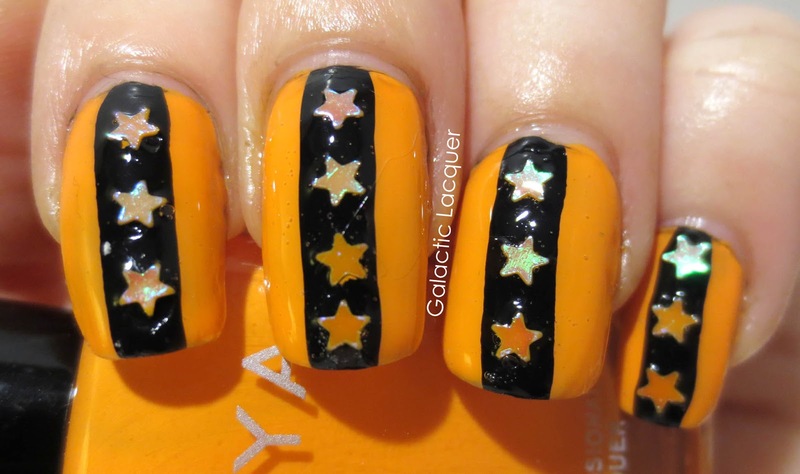 Black and orange are obvious Halloween colors, but the hint of yellow in this polish makes it a little more versatile to me. It reminds me of candy corn being paired with the orange, but it also just reminds me of autumn and fall leaves in general! 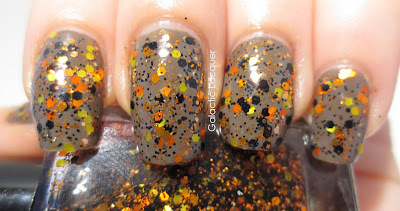 I applied two coats of Trick or Treat over Sinful Colors Nirvana, and then topped it all off with a coat of Out the Door. One coat of Trick or Treat covered well, but I wanted the glitter to be pretty dense over my brown base. 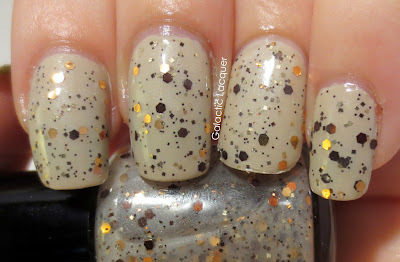 It has just the right amount of glitter - it covers well, but it also applied great! I didn't have to manipulate the glitter, and it wasn't too thick either. 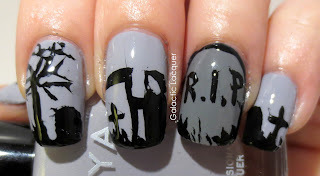 In my opinion, it's another great Halloween polish! 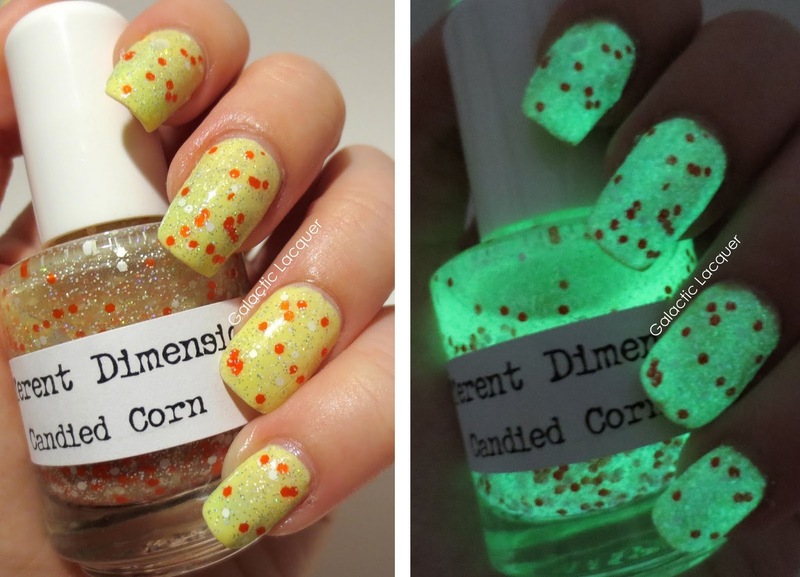 I like this color combination, the size of the glitters, and how well it applied. I may have to bring it out again next month! I bought this polish from Daring Digits's Etsy shop. Her full size polishes sell for $7.75 each. 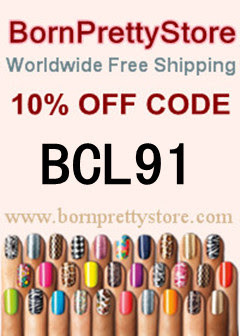 She's also beginning to sell polishes on ddpolish.com for just $6.75 each, but currently, her Etsy shop has a larger selection. I can't believe it's already the 14th! 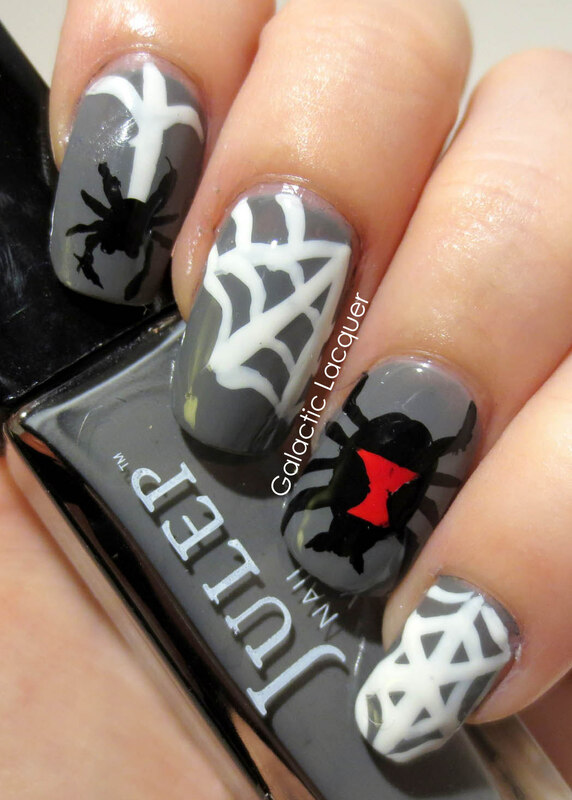 It seems Halloween will be here before I know it, and I still have so many great Halloween polishes to share with you all. 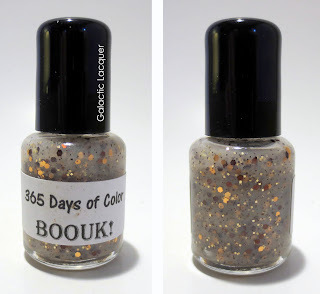 One that I've been dying to try for a while is called Boouk! from 365 Days of Color. Boouk! 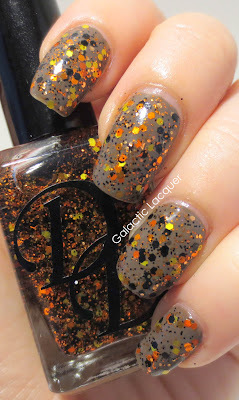 is a polish from 365 Days of Color's Hocus Pocus collection, inspired by the movie Hocus Pocus. Boouk! is a sheer neutral base with some shimmer to it. It is filled with different glitter, mostly copper in color. It has both darker and lighter copper hexes, along with some finer goldish squares, and even finer copper microglitter. 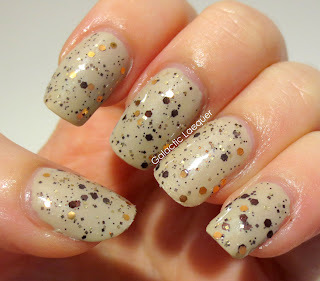 I'm actually enjoy neutral polishes, so I happen to like this one a lot! Although it is a bit sheer, so I applied it over Essie's Sand Tropez. I applied two thin coats of Sand Tropez, and then applied one good coat of Boouk! on top. 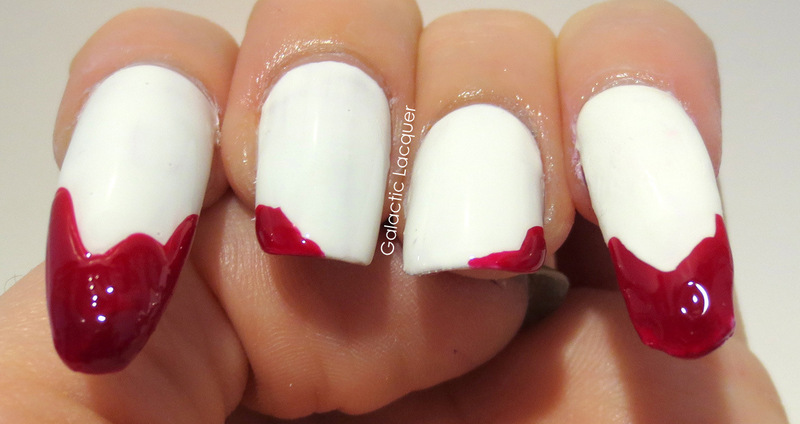 I topped it off with a layer of topcoat, and voila! I didn't have to manipulate the glitter in any way, and just applying it like normal polish covered very well. I could have done another coat to make it more dense, but I'm happy with how it turned out. The shimmer from the base is a little lost, even though I applied it over a creme, but perhaps more coats would have made it more obvious. Still, it's a gorgeous polish, and I love the copper! 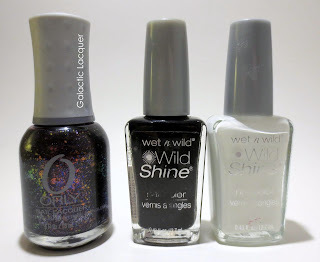 I was actually looking for a copper glitter polish or topcoat too. The images make some of the copper glitter appear black, so it looks orange and black in the photos. 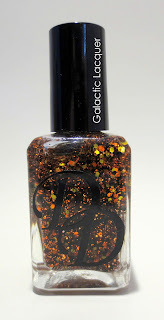 Perfect for Halloween, although both shades of copper glitter are definitely copper-y in person! 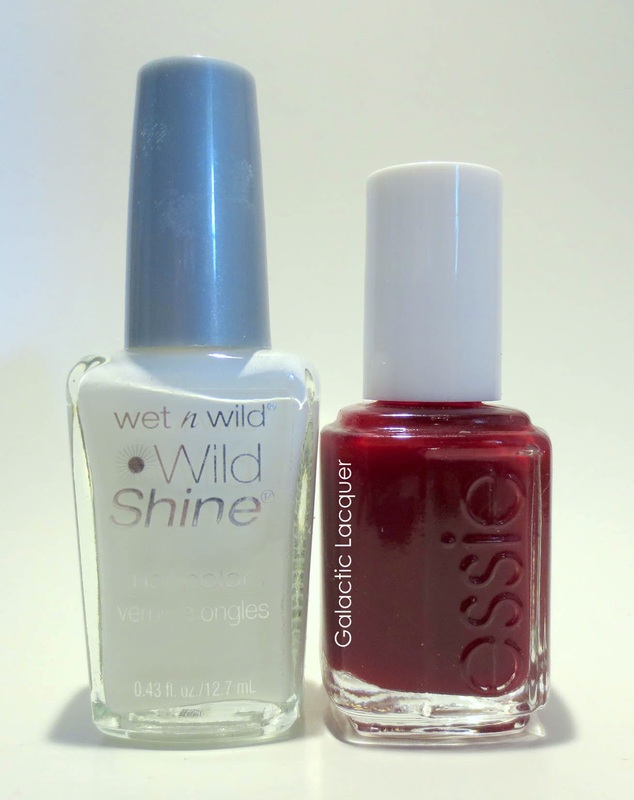 Bonus: I've also been using Sunny's Cuticle Oil, also from 365 Days of Color, for a long time. I had gotten tons of her miracle balms, but she started producing cuticle oils too. 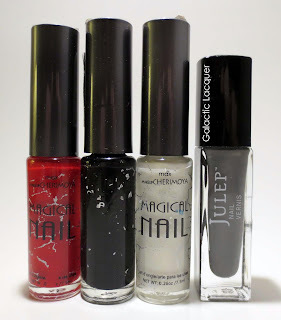 I use these when I'm done with just about every manicure, so I had to give them a shoutout! I bought the full size cuticle oils, so here it is in my hand for a sense of scale. They're pretty big, and I haven't even put a dent in it yet! The Candy Corn scent also smells fantastic. It's like the syrup-y sweet scent of candy corn, but it also smells like cinnamon to me! Even if Candy Corn isn't your forte, she has literally tons of scents to choose from!